+Christopher Jefferson wrote me some time ago to remind me about his good puzzle game Combination, which is one of my favorites. Unfortunately, after whetting my appetite with news about an upcoming new game, he disappeared into a void. So reviewing this game is all I can do for now. Combination is played on rectangular boards of various sizes. The pieces you control, when placed on the board, fire colored beams in 4 or 8 directions. You can also think of them as Rook, Bishop, and Queen chess pieces. The goal is to place all pieces on the board, avoiding that any piece is hit by a beam of a different color. The pieces must be placed on the white squares. The gray squares allow beams to pass, but you can't put pieces on them. The walls block the beams. One thing that isn't visible above is that the beams don't cross the pieces they hit. This property often needs to be taken advantage of to solve a puzzle. Solving the puzzles is fun, and usually requires a lot of tinkering until the placements are just right. The user interface is intuitive and never gets in the way. I particularly like the smallest puzzles, where you have a small number of pieces to fit in a tight space. The resulting web of beams is intricate, and it sometimes seems impossible that everything could fit. The board is still small, but there's a large number of pieces to fit. I like these puzzles less--they're too complicated for me and I don't see a way to attack them systematically using logic. The one thing I don't particularly like is the graphics style; I would have preferred something more abstract. But this something easily forgiven. Combination is currently free, so there's no reason to not go and download it right away. The mechanics are excellent, and the difficulty range is so vast that it's sure to appeal to everyone. 1Button is an indie studio that develops apps and games with a very distinctive, minimalistic style. Their latest puzzle game is called ON/OFF, and it has been downloaded over a million times, so you might know about it already. At the time of writing, there's a promotion going on: by tapping a button on the developer's website, you can unlock all available levels for free. At the core, this is a tile sliding puzzle, where each row/column scrolls at once, wrapping around at the sides of the board. On the App Store there's a gazillion of apps using these mechanics, so nothing new so far. One novelty when compared to similar puzzles is that instead of reconstructing a picture, you have to connect coloured "switches" on the sides of the board, using tiles of the same colour. Another novelty is that the playing area is not necessarily square or rectangular, but can be any shape, as one of the first puzzles illustrates. Early on, another puzzle element is introduced: black tiles, which cannot wrap around from the sides of the board, therefore limiting movement possibilities. Other elements introduced later include tiles larger than 1x1, which cause multiple rows/columns to scroll at the same time, and must not be split by wrapping around the sides of the board. There's currently a total of 220 puzzles, split across 11 "worlds". Some worlds are free, others can be bought using in-app purchases. The puzzles can be played in any order, but some worlds are locked until all puzzles in the previous world are solved. The puzzles in this game can be hard, however my feeling is that they are more tedious than difficult. The boards are often unnecessarily large, as some of the screenshots in this review illustrate. Solving such puzzles surely requires patience and a lot of mechanical repetition, but the need for intuition is too diluted to make me find them interesting. Fields by Kevin Langdon is a restyling of the classic Fillomino logic puzzle, which is published by many magazines. I like when developers take their time to rethink how a classic puzzle is played, in order to make it work better on a touch screen. On paper, Fillomino is typically played by filling with lines and numbers a white grid, like this image taken from janko.at shows. This works on a magazine, but it would look pretty boring on an iPhone screen. Fields adds colours, by associating each number with a flower (except for 1 which becomes just rocks). To fill an empty cell, you just drag from a populated cell nearby. The goal is to completely cover the grid with flowers, in such a way that the size of each area matches the numbers given. So in the image below, we want to have 4 sunflowers and 2 violets. One thing that isn't immediately apparent is that the dragging you make doesn't need to be a single motion; so in the case above you can drag right from the 4 to colour two cells, then lift the finger, and drag down from the 4 to colour an extra cell. Here you can see that there are two ways to complete the 3 field, and both lead to a valid solution. This is a major letdown for a puzzle like Fillomino. These puzzles must have a single solution to be fun. Currently, Fields contains 100 puzzles of various sizes, from 4x5 up to 8x11. 8x11 feels a bit tight on iPhone and you need to be careful where you touch, but it's still playable. Like other puzzles released recently, the game is free and offers the ability to buy hints through in-app purchases. Fields makes me a bit sad. It has a good user interface, much more enjoyable than other ports of Fillomino, but some of the puzzles are sub-par due to the multiple solutions. Luckily, this shouldn't be too difficult to fix in an update. Update 10th June 2013: the issue of multiple solutions has indeed been fixed in an update. A small update to Brain Twirler has just been approved by Apple. The only significant change is to what happens when you tap a solved puzzle. Previously, it would just go to the next puzzle, but this was confusing many people. Often times, people would select a solved puzzle, and then tap through a number of solved puzzles before reaching the first unsolved puzzle. So now tapping a solved puzzle jumps right to the first available unsolved puzzle. The state of the puzzles is persistent between sessions, so if one wants to play again a solved puzzle, it needs to be explicitly restarted using the restart button. There's also small changes to the graphics. Have fun and thanks to all the people that downloaded Brain Twirler! 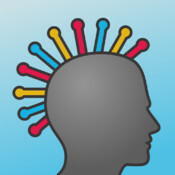 Brain Twirler is now available on the App Store. It is my second game for iPhone and iPad, and the first to appear under the Nontrivial Games label. The inspiration for this game came from Spin Mix by Ivan Vassilev, which I reviewed some time ago. There are three kinds of pieces. The red one is the shortest, and there's always exactly one, because it is the piece that needs to be moved to the goal position. The yellow pieces are twice as long, while the blue pieces are something inbetween (sqrt(3)/2, to be precise). All pieces can turn by 60 degrees at a time, but the interesting thing is that while the red and yellow pieces can be parallel to each other, the blue pieces are offset by 30 degrees. This adds variety to the puzzle mechanics. The dashed circles indicate the pieces than can be moved. This is useful while learning how to play, and gives a substantial help while playing. For an additional challenge, there's the option to turn them off. There's support for unlimited undo/redo, which is preserved for all puzzles, even after quitting the app, and even after restarting a puzzle (after restarting, you can use the redo button to replay the solution step by step). I'm particularly pleased by the style of the thumbnails in the puzzle list. They remind me of some abstract art paintings. I wanted a clear progression throughout the game, and I didn't want to have too many puzzles, because the mechanics could get boring after a while, so the game has just 50 puzzles. Puzzle 1 can be solved in 1 move, Puzzle 2 in 2 moves, and so on; Puzzle 50 can be solved in 50 moves. You get one star for solving a level, and two stars for solving it in the optimal number of moves. It gets much harder to earn 2 stars in the later puzzles. How well you did is summarised in the puzzle list, using a "par" notation. 61 above par! I have to improve that one. At the beginning, 4 levels are unlocked, and for every puzzle you solve, a new one is unlocked. If you get stuck in a puzzle, there's a built-in solver which will suggest the best move from the current position. You are awarded an extra hint for every level you complete with 2 stars. If you run out of hints, you can get more through in-app purchases. I think limiting the number of hints should avoid the risk of spoiling the game by abusing them, while still leaving the option open when you are seriously stuck. If this game does well, I hope to also update Twin Beams in the future, adding new puzzles and switching to the Brain Twirler user interface style, with native iPad support. Often, puzzle collections aren't very good. I prefer games that are focused on doing a single thing in the best possible way. Simon Tatham's Portable Puzzle Collection, however, is a different story. It is more than a classic: it's a piece of history. The "Portable" in the name doesn't refer to mobile devices, but rather to software portability. It was initially created in 2004, before the iPhone even existed, and initially it ran only on Unix and Windows. I used to play it 8 years ago, on a Palm Tungsten E2, using a stylus. The portable collection consists of good logic puzzles, some well known, other less known, and it's still growing and being maintained. Currently it includes 36 different puzzles. The collection was actually already present on the App Store, under various names, both as a whole and as single games; as far as I know, in most cases this was done without acknowledgements to Simon Tatham. At long last, Greg Hewgill has done a "legit" port of good quality. Some of the puzzle names are a bit odd, for example Sudoku is called Solo, Slitherlink is called Loopy, and so on. The beautiful thing about this collection is that all puzzles come with a range of predefined sizes, parameters, and difficulties, which can be quickly selected. If the predefined settings aren't enough, there's a Custom option where you can set everything to your liking. This incredible flexibility can be achieved because all the puzzles are randomly generated every time you play. This is often a weakness in logic puzzles, as I am convinced that the best puzzles can only derive from careful selection and cannot be generated on the fly. Still, this is a reasonable compromise in the scope of this collection. There are some small criticisms to make to this first version of the port to iPhone and iPad, which will hopefully be addressed in future updates. Several puzzles give the ability to place crosses or other marks. When played on PC, that maps to the right mouse button, while on iPhone it has become a long press. In puzzles where you need to place several exclusions in a row, like Loopy, this gets a bit tiring and slows down the solving process. This could be mitigated by using a toggle switch in the toolbar. On iPhone, the puzzle selection list would probably work better if it used smaller thumbnails and shorter descriptions. Seeing just 4 lines at a time is a bit too little and requires a lot of scrolling to reach the puzzle you want to play. On iPad the puzzle list is a grid so it works much better. Finally, on iPhone, large puzzles are a hard to play and really need support for the pinch gesture to zoom. Again, this is less of a problem on iPad. Good logic puzzles, lots of variety, free, no ads, no in-app purchases. It's a no-brainer to highly recommend this collection. Ratio - the puzzle ($1.99), developed by Pantorix. Neither of the apps seems to be an official port, but they both credit Oliver Schaudt for the idea. Ratio is clearly better graphically, but let's talk about the puzzle. The board is a 4x3 grid, containing two large stones and up to 8 smaller stones. As you can see, the large stones are placed inside the grid squares, while the small stones are placed over the grid intersections. You only move the large stones. At the beginning, they are placed on opposite sides of the board. The goal is to swap their position. The clever part of the mechanics is the role that the small stones have on the moves you can make. As is clearly explained in the instructions, you can move a stone through a side only if there is exactly one small stone on that side. The reason for this rule is that when you do a move, the small stone slides across the side you passed through. So from the starting position higher above, if you move the red stone up, you end in the following position: not only the red stone has moved up, but the gray stone has moved right. Effectively this means that you need to find your way through a maze which changes shape every time you move. The puzzles are challenging; a lot more than it might seem at first sight. There is some sort of parity involved, but due to the two-dimensional movement of the small stones, it's more complicated than that. More often than not, when the solution seems close at hand, you find all your paths blocked and need to trace back. Ratio has 32 puzzles, split across 4 difficulty levels, so I think it's a verbatim copy of the official game. Sia Sola has 50 puzzles. Ratio is missing information about the optimal number of moves to solve each puzzle. In Sia Sola you can move only with drag&drop, in Ratio you can move both with drag&drop and by tapping the destination square. I prefer the latter. Ratio has a smooth and elegant menu system, which however isn't very intuitive to navigate. All in all, I prefer Ratio, mostly because it is more polished. YMMV. Regardless of which one you choose, the puzzle is recommended for its elegant mechanics. After publishing the review of Perfect Tiling a few days ago and making some criticism on the apparent inability to solve its puzzles through logic, I realized that one of the puzzle modes is, on the contrary, perfectly suited to logic deductions. I solved a few dozens puzzles in that mode and I couldn't stop playing. Here it was easy to start by putting a red tile in the bottom right corner, but soon enough things got trickier and there didn't seem to be an obvious way to move forward through logic. Eventually, however, I figured it out, and completed the puzzle using only rigorous deductions. It was challenging and enjoyable—exactly what these puzzles should be. Therefore, I updated the review to reflect my new discovery: just one of the ten available modes is enough to consider Perfect Tiling very good, and highly recommended. Everett Kaser has been developing logic puzzles for PC and Mac for something like 20 years. There's a large number of games available on his web site; a couple have been ported to iPhone and iPad, and Sherlock is one of them. Sherlock ULTRA ($3.99) which contains 7,500 puzzles. To add complexity to the choice, the PRO and ULTRA versions run natively on iPad, while the Free version is designed only for iPhone. The fact that the PC version is sold for $19.95, tells a lot about the impact of the App Store on the software industry. Starting from the title screen, the low resolution graphics scream "I'm a Windows 95 game". After starting the game, it's clear that this is a logic deduction puzzle in the vein of puzzle grids; however, it's quite obscure what you are supposed to do. The top half of the screen is where you have to build the solution; the bottom half contains the clues. The clues can be moved around for no apparent reason, and can be hidden by tapping on them when you don't need them anymore. The meaning of the clues is the fun part. 1) the 3 and the Pear are in the same column (this is the only intuitive one). 2) the Blue and Yellow houses are exactly two columns apart, but we don't know which one is on the left and which one is on the right. Also, the 3 is not in the column inbetween. 3) the Banana, Pear, and Orange are in three consecutive columns and the Pear is in the middle, but we don't know whether the Banana is on the left or on the right. 4) the Orange and 1 are in two consecutive columns, but we don't know which one is on the left and which one is on the right. 5) the Blue house is on the left of the Yellow face. Once you understand the above, solving the puzzles requires straightforward elimination of possibilities; for example, because of 1), the Pear cannot be in the first or last column. To eliminate possibilities, you tap on the columns to zoom in, then tap the item you want to exclude. To exclude all items except one, you tap and hold the one you want to keep. The puzzles are available in three sizes, from 4x4 to 6x6. 6x6 feels a bit crammed on the iPhone screen, surely it should play better on iPad. I think this game desperately needs a designer to make the interface clearer. At the moment, figuring out the rules is a puzzle in itself, and the user interface has way too many buttons and options. Also, the graphics look 20 years old (and probably are). The solving process is enjoyable but, despite the complexity of the clue system, feels somewhat mechanical. Would I want to solve 150,000 of these puzzles? Probably not. 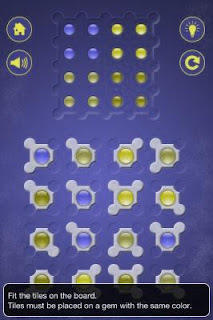 Perfect Tiling by Eric Paquet is a put-together puzzle game for iPhone and iPad, whose distinctive feature is that the puzzles are randomly generated every time you play. There's also a free version, which should be identical apart from containing ads. There are 10 puzzle modes, visible above. Initially only the first is available, and the others are unlocked in sequence. I found this a bit arbitrary and would have preferred all modes to be available from the start; what I would have added instead, is keeping track of the number of puzzles solved and the best time taken, for each puzzle mode. That would have added some motivation to take advantage of the randomisation and play your preferred modes multiple times. All puzzle modes are based on tiles whose shape is sort of a cloverleaf; each of the four leaves can be missing. The first puzzle mode uses a 2x2 grid so it acts as a tutorial: it's very easy to solve regardless of the random tiles you are served. I don't think the randomisation does anything to limit the number of possible solutions; it just ensures that there is at least one. Should you be stuck, there's also a hint option which will place one tile on the board, but can be used only once per puzzle. Also, for some unclear reason, in some puzzles you start with a tile already on the board (which cannot be moved around). 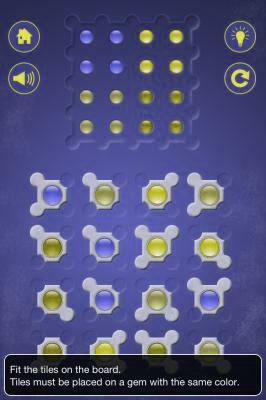 In most of the puzzle modes, tiles also have different colors. For example, you may need to ensure that in every row and column, every color is represented exactly once. A peculiar oddity of the user interface is that when you start dragging a tile, the tile snaps to a position that isn't directly below your finger, but a bit higher. This looked like a bug at first, then I realised it was done to ensure you can see the whole tile while you drag it around, otherwise you would covering it with your finger. Placing tiles on the board works well enough, but removing them (when you realise you made a mistake) felt a bit cumbersome. There isn't a quick way to pick up a tile and just throw it away with a swipe of the finger; you need to move it all the way down to one of the empty holes below the board. If you move it out of the board but not over an empty hole, it snaps back on the board. To be honest, in some of the puzzle modes logic doesn't seem to play a big enough part; it looks like all you can possibly do is place the first tiles almost at random, then attempt to fill in the gaps. here, for example, there's no other orange tile that could go to the left of the third tile in the second row, so that tile must be in the third column of the board. the fact that the tile colors are interleaved adds more constraints. I've solved several dozen puzzles in this mode, and in most cases a pleasing chain of deductions could be done. Occasionally, the deductions where definitely nontrivial. Even if it were for the fifth puzzle mode alone, this game is highly recommended. Make sure to have the patience to actually unlock that mode; it shouldn't be too difficult, and the patience will be rewarded by an unlimited number of good logic challenges.